The HamiltonBuhl Amplitude™ Soundbar, provides the latest MAXXBASS sound technology with a rich, deep and strong dynamic bass in a slim, attractive and compact design. 37 inches wide, with various audio source inputs, make it the ideal choice for home theater systems. This unit is easy to setup and comes with its own remote control. There are three preset sound modes. The music mode provides deeper bass with more dynamic sound range. The movie mode provides a surround - sound effect. The night mode has less bass and more clear vocals- ideal for news, radio, sports programming, etc. 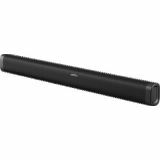 The Amplitude™ Soundbar supports Bluetooth, digital optical and AUX-In. Thumb-typing on smartphones and tablets can be cumbersome. While this style may be ok for social uses, it's different when it comes to educational purposes or during high stakes assessments. 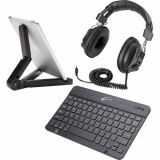 These kits pair three key accessories to take full advantage of the productivity offered by mobile devices. The KB4 Keyboard syncs with any Bluetooth-enabled iOS, Windows, or Android-based device. Once synced it disables the virtual keyboard for full screen visibility, meeting key PARCC & Smarter Balanced requirements and EPPA21, NCSC, WIDA and DLM standards. The TPT Tablet /Smartphone stand props the device to an ergonomically correct angle in landscape or portrait modes. Audio support comes with the rugged 3068 Headphone. Warranty for school use - unlike items purchased at consumer electronics stores whose warranties would be voided if used in schools. 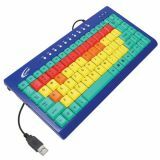 Help engage and inspire computer users with this keyboard designed for yournger students. Made from rugged ABS plastic for durability and safety, its fun, bright colors will help capture interest. 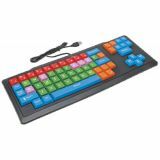 The color coded and simplified keyboard functions and keys (only 85 keys) will inspire their confidence. Contemporary new design and enhanced image quality meets reliable simplicity. Easy-to-use digital projection camera is also a web cam and photo/video camera. Great for students' multimedia projects across the curriculum or whole-class demonstrations of manipulatives in action, book pages, science models, and more. 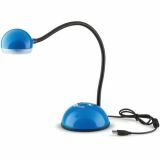 Connects via USB port to use with your computer or interactive whiteboard. Features 3MP digital images, adjustable gooseneck, auto focus, 8 LED lights, and internal microphone. No batteries required. Compatible with PC and Mac. Measures 20"H.
Help build early confidence and create opportunities for keyboarding success with these oversized keyboards. The enlarged and simplified designs include only the most commonly used punctuation & special characters on standard sized keyboards. This makes the wired KB2 an ideal solution for early learners, beginning keyboarders and students with special needs who are engaged in basic activities. The extra large keys help familiarize typists with the QWERTY-style layout. With color-coded keys to familiarize students with vowels (pink), consonants (green), functions (blue), punctuations (orange) and numbers (red). 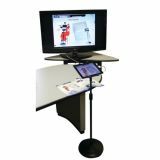 The plug and play convenience disables a tablet's on-screen virtual keyboard, enabling students to see the entire display, meeting a key PARCC and Smarter Balanced requirement. It's also aligned to NCSC, EPPA21 and DLM standards. 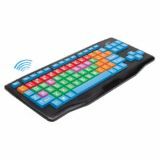 Help build early confidence and create opportunities for keyboarding success with these oversized keyboards. The enlarged and simplified designs include only the most commonly used punctuation & special characters on standard sized keyboards. This makes the wireless KB3 an ideal solution for early learners, beginning keyboarders and students with special needs who are engaged in basic activities. The extra large keys help familiarize typists with the QWERTY-style layout. Both models have color-coded keys to familiarize students with vowels (pink), consonants (green), functions (blue), punctuations (orange) and numbers (red). Once the wireless USB connector for the KB3 is plugged into a device, it too disables the on-screen virtual keyboard, enabling students to see the entire display, meeting a key PARCC and Smarter Balanced requirement and is also aligned to NCSC, EPPA21 and DLM standards. Presenters can use the speaker to stream songs from Pandora®, Spotify®, or Twitter Music for classes. Educators can even use the speaker to stream podcasts from iTunes U® or enhance audio from an iPad® or other connected device from a Skype® chat, Google®+ Hangout, Facetime® or a virtual field trip. This portable speaker is compatible with a variety of smartphones and tablets including Android® and iOS-based devices such as the Galaxy®, iPhone® and iPad®. The 30-watt speaker delivers room-filling (up to 300 people) wireless sound, and is a practical alternative to complex audio amplification solutions in schools, churches, meeting rooms and other presentation settings. 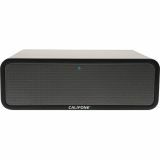 Designed for fast and easy setup, offering convenient connect-and-play audio streaming capabilities and can effortlessly fill a 50x50' class or meeting room. Since the speaker enables interactive group and whole class learning, educators have a variety of options when incorporating the technology into classroom activities. The speaker includes a USB charge port and auxiliary line input to allow for expanded device compatibility. Works with Bluetooth enabled smartphones and tablets from the following manufacturers (but not limited to): Acer®, Alcatel®, Apple®, Asus®, AT&T®, Blackberry®, Dell®, Garmin-Asus®, Google®, HTC®, HP®, Kyocera®, Lenovo®, LG®, Motorola®, Nokia®, O2®, Orange®, Palm®, Pantech®, Philips®, Samsung®, Sony®, Sony Ericsson®, T-Mobile®, Toshiba®, Vertu®, Vodafone®. Ergonomic hand free stand for iPadTM and 7"-10" tablets. Height adjustable from 37" to 57.9". Rotates 360° offering vertical and horizontal views. 180° tilt adjustment. Stable weighted base. Ready-to-assemble.